It’s a dangerous business, Frodo, going out of your door…You step into the Road, and if you don’t keep your feet, there is no knowing where you might be swept off to. Like our last Artist in Profile, Roger Garland, Inger Edelfeldt is another artist who used to illustrate Tolkien but has now moved on to other things leaving us wanting more. She grew up in Stockholm where she still lives and she is now most known for her writing which includes novels, children’s books (which she illustrates herself), poetry, plays and, most of all, challenging books for teenagers about the difficulties of growing up in the modern world, for which she won the Deutscher Jugendliteraturpreis. Perhaps a lingering Tolkien connection can be seen in her recent book for young adults: Skuggorna i spegeln (The Shadows in the Mirror), where her protagonist, Arri, has been named by her parents after Arwen from The Lord of the Rings, and who has a chance to escape the problems of the real world into a fantasy land, through her bedroom mirror. There is beautiful detail on his buckle and on his bow, and also in the lichen on the rock which has been achieved by using a stippling effect with the point of a very fine brush on a dry wash. I’m guessing, looking at her paintings, that she works only in watercolour which gives the beautiful subtlety of tone you can see in the background. You can also see the same dry stippled effect on the trees and there is a wet-in-wet wash in the far left background which makes the distant trees fade magically into the sky. She builds up a lot of the body of the painting, though, using a layering of very fine strokes in the same way that many of the 19th century watercolour masters did. There is such wonderful detail here and you can look at it again aand again, and still find something new. 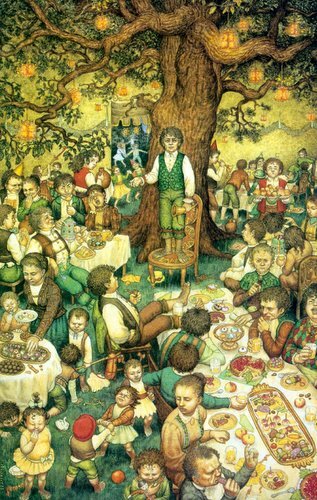 Everything about it is delightful from the chubby Hobbit children at the bottom to the food which has some nice healthy fruit (and even a carrot) along with the multitude of cakes and cherry pie. Bilbo’s outfit is, of course, very splendid as befits his wealth. The detail and interest in the picture almost makes you forget that it’s painted from a very difficult perspective - where we look down on the scene from a high point - and in an unusual upright format for this type of scene. It’s an interesting way to tackle a large group and not the obvious choice to go for, but it works magnificently, creating a lot of activity and allowing us to see a large number of figures in detail all at one time without them blocking each other. Many more versions of her Tolkien work (including larger versions of those shown above) can be seen at Rolozo Tolkien. Last edited by Iolanthe on Thu Aug 10, 2006 9:52 am, edited 1 time in total. Thanks for showing us these, Iolanthe. I love "A long expected party", it reminds me of Breughel's paintings! "Torment in the dark was the danger that I feared, and it did not hold me back. But I would not have come, had I known the danger of light and joy." It does! That's a good observation . I really like that painting, there's so much to enjoy in it. Thanks for introducing us to this artist Iolanthe! I like her depiction of the scenes, and I agree that the painting of Legolas is beautiful (I've never seen him with black hair!). I don't think I've ever noticed this artist before, although I visit Rolozo Tolkien often enough, so thanks for the intro, Iolanthe. The detail is amazing! I think Tolkien tells us that Legolas has dark hair, doesn't he? Merry wrote: I think Tolkien tells us that Legolas has dark hair, doesn't he? I don't remember ever reading anywhere what color Legolas' hair is, though I've read discussions about it. I've always thought of him as blond, because I thought his father was described as having blond hair (though I can't seem to find where it says that now). Perhaps an interesting conversation to continue on a different thread? I thought all the Woodland Realm elves were dark haired, unlike the Noldor. He describes himself as Silvan, but his father, Thranduil is a Sindar. I can't quite remember but I thought only the Vanyar and the Noldor had blond hair or was that just Finarfin's lot? Edited to add: Actually, looking around the internet, this is another 'Do Balrogs have wings'?
. . . at the head of a long line of feasters sat a woodland king with a crown of leaves upon his golden hair . . . 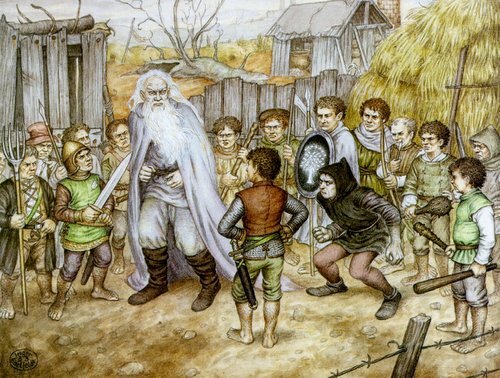 I know that Tolkien did indicate that aspects of The Hobbit do not mesh entirely with LOTR. In fact, the original version of Bilbo's encounter with Gollum ended quite differently, and Tolkien revised it significantly when LOTR moved to publication. However, if he did not intend for Thranduil to be blond, it would have been a very easy item to correct when he was making other revisions to The Hobbit so that it would fit better within the world of LOTR. The fact that he did not make this change indicates to me that he either intended for Thranduil to remain golden-haired, or it was simply inconsequential. Hence, there is precedent in the Tolkien canon for Legolas to be blond like his father. I knew it was in there somewhere! Thanks for finding it Lindariel! I seem to remember when the film (don't mention the film ) came out there was a lot of protest about Legolas's hair being the wrong colour. Guess they weren't up to scratch on their Hobbit! Or they thought Tolkien should have revised it after all. When I googled this I couldn't believe how much heated discussion there was on elven hair out there! Is there some basis for the argument that he wasn't blond, in your googling, Iolanthe? The only slim evidence I can think of is that, when the Company is on the Anduin and attacked by the enemy, Leggy shoots at something big in the sky, and Tolkien said his head was 'dark' in the moonlight. But I don't think that's clear. Merry, you may recall that quite some time ago (August 2004), Yavanna over at WRoR posted a link to an article on elven genetics: http://www.luchau.org/writing/elven-genetics. Unfortunately, the website no longer exists, and I can't find the copy I printed in order to quote directly from the article, so I must go on memory. The issue of whether Legolas had dark or blond hair was an impetus for this article. While I think the author makes some wonderful and very valid points, I also think she was very hasty to discount the description of Thranduil in The Hobbit out of hand as simply an oversight on the author's part, despite the fact that Tolkien had multiple opportunities to correct this "oversight" in subsequent editions, as I mentioned above. By doing so, she discounts her own argument that Tolkien took great care to make note of those with exceptional appearance -- i.e., golden or silver-haired elves, when the majority are dark. I do think she was correct in taking Peter Jackson to task for making all of the Lothlorien elves blond. 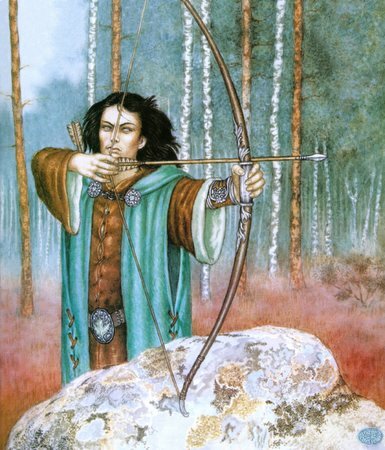 The Lothlorien elves were primarily Silvan elves and would have been dark-haired. Galadriel and Celeborn were exceptions because they were Noldor and Sindar elves, respectively, and not Silvan. As far as PJ's choice to make Legolas blond in the movie, I would imagine this was driven by a desire to differentiate the tall elf at a distance visually within the Fellowship from the two tall dark-haired Men, Aragorn and Boromir, and the tall, white-haired wizard Gandalf. Think of all those long shots and the CGI characters they had to produce. Personally, I have no problem with Legolas being blond. Thranduil comes off as a rather vain and materialistic fellow in The Hobbit. I have no problem imagining him being rather proud of his unusual blond hair to the point that he would seek out a wife with similar characteristics in order to preserve that uniqueness in his line. Two double-recessives could only produce another double-recessive, hence Legolas would definitely be blond, given these assumptions. Thanks for explaining all that, Lindariel, That's a pretty good summation of all the dicussions I've read in my googling! I've edited a note into my hair comment in the Edelfeldt piece as I'd forgotten Thranduil was one of the rare blonde elves. You wanted me to go to MeJ and post sth, so I'm going to a thread with no replies for 8 years, yesss! The reason for this is that I saw a nice elf picture by someone I guessed was a Swede, name Per Sjögren, posted elsewhere on this forum, wanted to know which elf it was supposed to look like, so I tried to find it on Rolozo, which I did, it was Glorfindel. 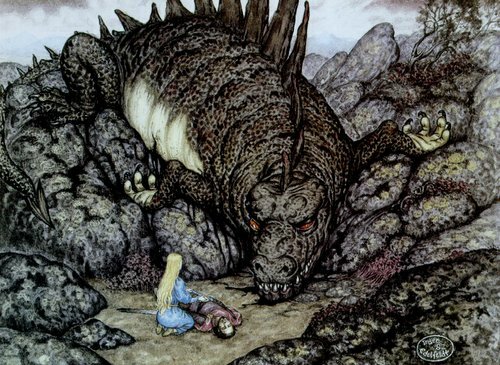 Then I remembered that Inger Edelfeldt, an old favourite of mine, was in the Rolozo gallery as well, so I checked out those pics, I think they're mostly from that Tolkien calendar 1985, that I sadly don't have. I especially love the Stone of Erech with the grey shadows following Aragorn, no stupid, slimy, green zombies. 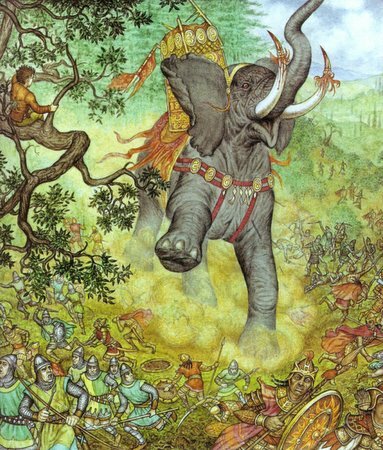 It's possible that some of these illustrations are in my Tolkien books at home, because, as it happens, Inger Edelfeldt is one of the reasons I fell, hard, for Lord of the Rings in 1985. The Swedish edition, three volumes, I got in 1984, Dad bought it at the annual book sale, has dust covers with illustrations by I.E. In 1988 I got the next three volumes in that series, another book sale find: Silmarillion, Ringens värld (LOTR appendices plus more) and Sagor från Midgård (Unfinished Tales), with more I.E. book covers. There are also some illustrations within the books, but can't remember which ones. I think I.E. 's illustrations sometimes are too fairytale-like with 19th century medieval look à la Howard Pyle, but the colours are great, often subdued, not to bright and scary, so very much in line with Swedish tradition, like for example John Bauer and Elsa Beskow (not Tolkien, classic early 20th century fairytales). I too find her illustrations very evocative, like that she has some unusual motives with lots of lovely details. A couple of years ago Inger Edelfeldt was a guest at the FFF in Lund, had a small exhibition of Tolkien illustrations and more, loved it. She looked very young, like in her thirties and more or less like a goth girl. She didn't dress like middle-aged ladies in the culture business do, often colourful and excentric you know, she was definitely into black. I got to talk with her a little bit, got her autograph in my Swedish FOTR, the book that really got me in love with Tolkien and Strider. I can't remember much from our conversation but I did tell her that I loved that picture that shows The Paths of the Dead correctly, it must be the one in the Rolozo gallery called The Stone of Erech, what a portrait of Aragorn. Sadly I got the impression that Tolkien was very much in the past for her, that she had moved on to her own much darker material and very different things, so I don't think she'll ever make more Tolkien illustrations. I googled "Sagan om ringen Inger Edelfeldt" and got an interesting result, a site that sells her originals, also some signed prints, prices in SEK, ranging from 500 SEK for signed prints to between 1500 and 25 000 SEK for originals. You could for example get the original gouache of Death of Boromir for 25 000 SEK ($4000 or €2800) or a King Théoden not used for the calendar for 2000 SEK ($310 or €225). Not bad for fans of Inger Edelfeldt. Description "ej använt motiv till Tolkien-kalendern" means "not used motif for the Tolkien calendar"
"Sagan om konungens återkomst" is the Swedish title of the book "The Return of the King". There are three different ROTK illustrations, originals they're selling, one discarded with Frodo, Sam and eagles at Mount Doom, one with a rider on a white horse used for the book I have, one with Gandalf held by eagle for the pocket version. I would especially like you to look at Riddles in the Dark, I like that one, great tension between Bilbo and Gollum. ETA: I found Inger's blog linked from her Swedish wikipedia page, it hasn't been updated for more than two years, but if you want to read her thoughts (in Swedish but there are online translators), she's smart, funny and sometimes political, but you need to see her photos, some are lovely, she seems to like nature and wild, sometimes winter dead gardens, also great, unusual pictures of Stockholm. I think she sees similar things to what I appreciate to look at, both in cities and in nature, she not only has a great eye, but can take photos as well. And she hasn't forgotten Tolkien completely, in one post she contemplates getting tattoed, possibly Gollum. he rode singing in the sun, sword unsheathing. out of loss, out of life, unto long glory. I enjoyed looking there, Estel--thanks! They do have a very fairy-tale illustration kind of quality, but I think that's appropriate. But I'd like to ask her not to get a tattoo of Gollum--not a good idea.